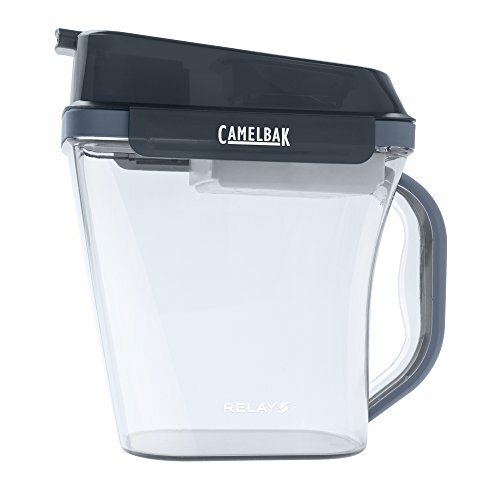 CamelBak’s water filter pitcher uses a fast-filtering cartridge that will fill the pitcher in no time whatsoever. This model should be used by people who have clean but chlorinated water. Unlike the other models we included on our list, this filter won’t remove a large diversity of contaminants. This is a water filter pitcher with a slim design but a large container capacity. You can fill up to 10 cups of water in this container, and the slim design will help you to manipulate the filter easier and to fit it in the fridge. The filter is made out of Tritan, a BPA-free material, so you will be able to use it for a long time without any problems. One of the advantages of using this model is the high filling rate. The water filter pitcher uses a double filter technology to speed up the filling time, but at the same time to capture most of the contaminants in the water. This technology allows the filter to fill up 10 times faster than other water pitcher filters. This water pitcher filter uses a special kind of cartridge filter, and it’s the only one on our list to do so. The cartridge is very efficient at what it does, and it filters the water quickly. Unfortunately, this cartridge filter is only capable of removing chlorine, chloramines, bad tastes and smells from the water. All the other water filters we included on our list are capable of removing many categories of contaminants, but not this one. The difference between this model and the others consists of the filter’s design. While all of the other models use a thick and tall cartridge filter to clean the water, this one uses a smaller one. The main active components of this filter are a non-woven material that will remove most of the larger particles, such as silt, dirt, sand, rust, and debris, and a thin activated charcoal filter. After passing through the non-woven material, the water will reach the activated carbon filter, but because this filter is not very thick, it won’t spend enough time in contact with it for many substances to be filtered. Only chlorine and chloramines will be removed after this brief contact, along with the bad tastes and odors. While some other water pitcher filters are so effective at removing contaminants that people consider using them instead of other types of filters, this one should only be used it your water is not heavily contaminated. If you tested the water and everything seemed okay except for chlorine, this is the model for you. The manufacturer doesn’t provide a maximum filtering capacity, it only states that the filters should last for up to 4 months. Since the filters will only remove silt, dust, debris, rust, and chlorine, we believe it’s the non-woven material that will need changing long before the activated carbon does. Even though this filter has a great filtering rate, and it lasts longer than any other model, the fact that it only removes so few contaminants might be a problem for most people. This pitcher has a maximum capacity of 10 cups or 0.62 gallons. This is a medium capacity, and you might have to refill the pitcher throughout the day, depending on your water consumption. The pitcher has a nice slim design which will allow you to manipulate it with ease. The slim design also makes it perfect for storing in the fridge. However, the filters are easy to change, and buying new ones will be cheap. You can buy a set of 3 filters with approximately the same price you would buy a single filter made by a different manufacturer. The 3 filters should last for about a year if each one lasts for up to 4 months. Very Fast Filling – This is one of the fastest-filling water filter pitchers available on the market. Thanks to the double filter technology, this model will fill up in no time. Good Design – The pitcher is slim and it has an ergonomic design. You will be able to pour water without spilling it, and you will be able to store the pitcher in a crowded refrigerator without any problems. Filter Change Notification – This filter uses a gouge to notify you when it’s time to change the filters. Filters Only Chlorine, Taste, And Odor – This water filter pitcher filters only chlorine, and it removes the foul tastes and odors from the water. Most of the filters produced by the competition are effective at removing other components, as well. Filtration Slows After A Time – Even though this water filter pitcher has the best filtration time from all the models we reviewed, it will slow once the filter approaches the four-month limit.